Welcome to the website for the South Tamar Mission Community. Please look at the About us page to read a little more about who we are. New information will be added to the website weekly. The Bishop of Exeter has taken a tour of his garden to illustrate the Diocese of Exeter’s four key aims for 2019. In the video Bishop Robert outlines plans to help churches reach out to: children and families, young people aged 17 to 25, people over 55 and those on the fringes of church. The four aims build on the diocese vision to: Grow in prayer, Make new disciples and Serve the People of Devon with joy. 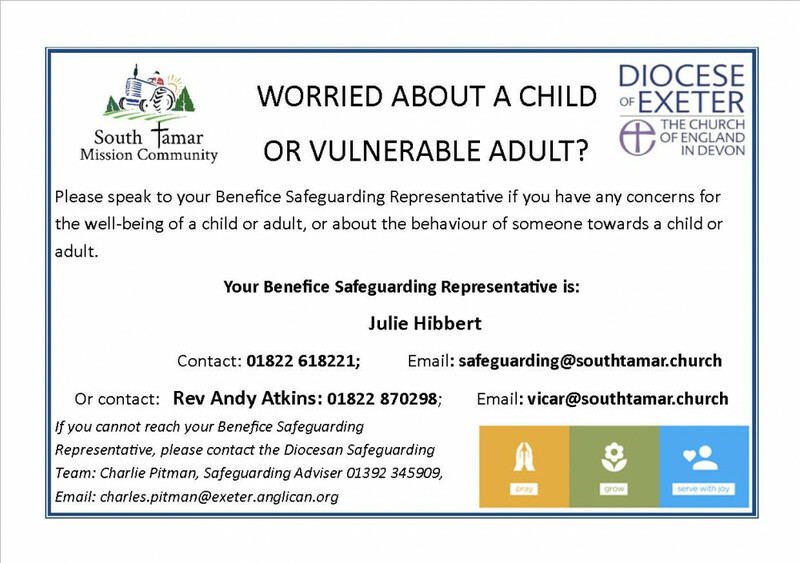 Please clich here for more information, including our own Benefice "Safeguarding Policy",along with our Diocesan "Parish Safeguarding Handbook".